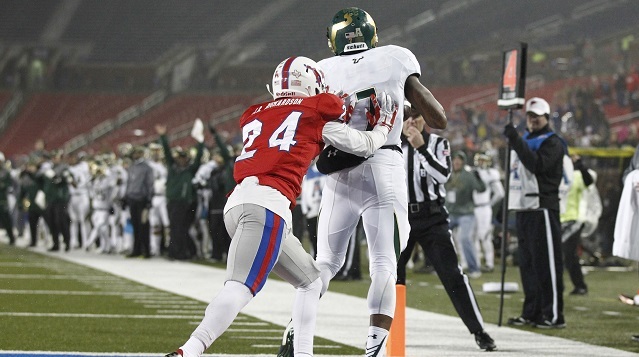 They say football games can be decided by a matter of inches but on Saturday night, it was a matter of seconds as the SMU Mustangs remained winless in the 2014 season when Mike White connected with Andre Davis for a four yard touchdown with four seconds remaining to take a 14-13 lead. The play was not without controversy as many of the 19,643 fans that braved the cold Dallas night felt that Davis pushed off defensive back J.R. Richardson to create space to make the catch. White, who replaced freshman starter Quinton Flowers in the fourth quarter, showed an improved command of the offense as he completed 9-of-16 passes for 106 yards while leading the Bulls on two touchdown drives — including six during the game winning 20 play 75 yard drive. As with USF, the Mustangs have had its own quarterback struggles on the season and despite the defeat Saturday, Coach Tom Mason may have found his starter going forward in Matt Davis. Davis followed up last weeks 393 total yard performance against Tulsa with another good statistical game as he passed for 189 yards on 22-of-31 attempts and contributed 53 yards with his feet. Another player that had a good play was receiver Der’rikk Thompson, who finished the game with three catches for 96 yards including a 45 yard play that helped up the Mustangs only touchdown on the night. Thompson, a senior from Troup, TX, is the team’s leading receiver with 512 yards on the season and has served as the teams big play threat averaging 16.5 yards-per-catch. The Bulls improve to 4-6 (3-3) on the season and travel to Memphis, TN to face the surprising Memphis Tigers program who is 7-3 (5-1) and atop of the American Athletic Conference standings. Still in search of its first win of the season the Mustangs 0-9 (0-5), travel to Orlando, FL to take on the UCF Knights who are 6-3 (4-1).